(NaturalNews) It is common knowledge that eating vegetables and fruits is part of a sensible diet, and yet millions of otherwise health-conscious people ignore this advice and continue to nosh on a variety of processed junk foods placing them at considerable risk to succumb to the leading killer of men and women in the US and western societies. Mortality statistics clearly show that more than half of all deaths each year are due to cardiovascular disease, a largely preventable illness that can squelch life in an instant or dramatically lower quality of life as the heart is strained to supply oxygen and nutrients throughout the body. Researchers from the Minneapolis Heart Institute have presented the results of their research to the American College of Cardiology's 63rd Annual Scientific Session that demonstrates how women who were eating a diet high in fresh fruits and vegetables as young adults were much less likely to have plaque build-up in their arteries 20 years later compared with those who consumed lower amounts of these foods. Prior studies have provided incidental evidence about the importance of eating a diet packed with fresh produce in its natural form, but this research provided documented proof by utilizing Coronary Artery Calcium (CAC) scans that show the percentage of arterial blockage in the heart by measuring vascular calcification. Lead study researcher Dr. Michael Miedema commented "It's an important question because lifestyle behaviors, such as a heart healthy diet, are the foundation of cardiovascular prevention and we need to know what dietary components are most important." The study included 2,508 participants from the ongoing government-sponsored Coronary Artery Risk Development in Young Adults (CARDIA) that analyzed diet over a 20-year period utilizing dietary food questionnaires. Research began in the mid-1980s with a group of men and women 18-30 years of age and has collected extensive data on medical, socioeconomic, psychosocial and behavioral characteristics. The scientists found that women who reported consuming the most fruits and vegetables (eight to nine servings a day for a 2,000-calorie diet) in their 20s were 40 percent less likely to have calcified plaque in their arteries in their 40s compared with those who ate the least amount (three to four servings a day) during the same time period. In their analysis, researchers controlled for smoking, exercise, consumption of red meat, sugar-sweetened beverages and other dietary and cardiovascular risk factors that correlate with atherosclerosis. Dr. Miedema concluded "These findings confirm the concept that plaque development is a lifelong process, and that process can be slowed down with a healthy diet at a young age... this is often when dietary habits are established, so there is value in knowing how the choices we make in early life have lifelong benefits." 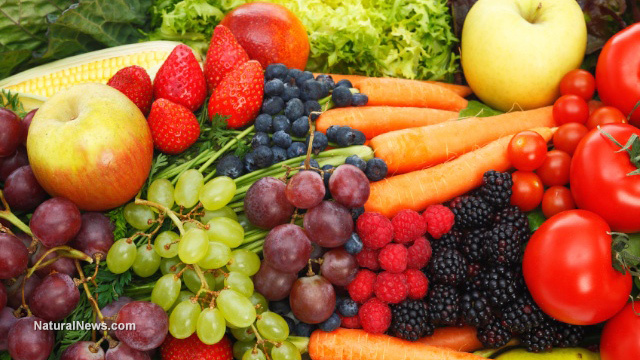 The researchers noted that fruits and vegetables are packed with vitamins, minerals, fiber, antioxidants and other things that are known to promote good health. The study underscores the importance of including 2.5 cups of vegetables and 2 cups of fresh fruits each day (8 to 10 servings) to slash cardiovascular risk by nearly half.